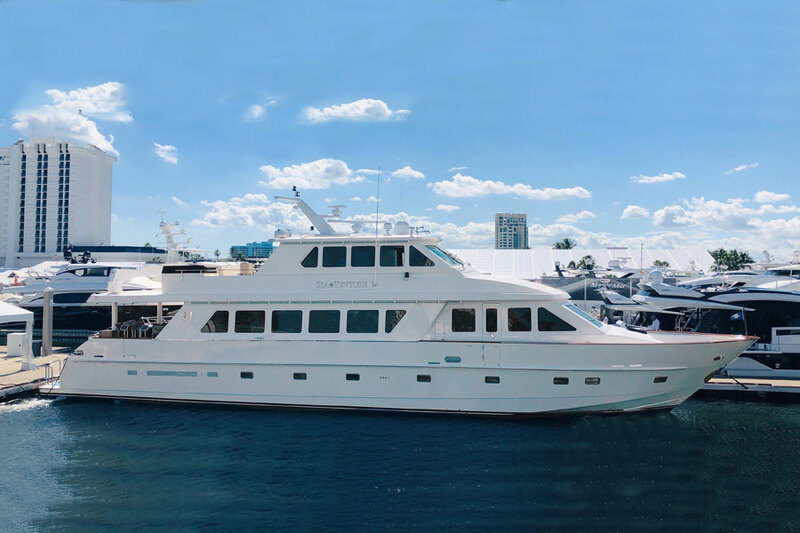 94 hargrave Enclosed Bridge Motor Yacht 2001 Sea Venture : Atlantic Yacht & Ship, Inc.
Atlantic Yacht and Ship, Inc. proudly introduces the 94 Hargrave Enclosed Bridge Motor Yacht 2001 – Sea Venture to the used yacht market! The 94 Hargrave 2001 Enclosed Bridge Sky Lounge Motor Yacht will take you wherever you want to go in style! In fact, she accommodates 5,000 gallons of fuel. To demonstrate, Sea Venture could take you non-stop from South Florida to the British Virgin Islands! The 94 Hargrave 2001 “Sea Venture” was refit in 2017. All in all, she is fresh inside and out. 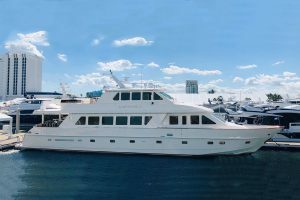 The 94 Hargrave 2001 Enclosed Bridge Sky Lounge Motor Yacht has all new interior and soft goods. In addition, the entire vessel was painted top to bottom. Also, her running gear was pulled and serviced. The 94 Hargrave Enclosed Bridge boasts massive interior volume. To illustrate, there is formal dining for 8, country kitchen, day head and spacious salon. 3 staterooms are accessed from the mid-ship Salon. Plus, 2 additional staterooms are accessed forward of the Galley. 1 crew stateroom is accessed from the stern. The Owner has flexibility to configure the staterooms as 5 Guest plus 1 Crew or alternatively as 4 Guests plus 2 crew. Furthermore, there is tremendous headroom onboard. For instance, the salon has 8 feet of headroom and the Galley has just over 8 feet! No more bumping your head in doorways! Sea Venture is easy to see in Ft. Lauderdale. Schedule an appointment today with Chris Carroll 954-303-5604 or chrisbcarroll@gmail.com.